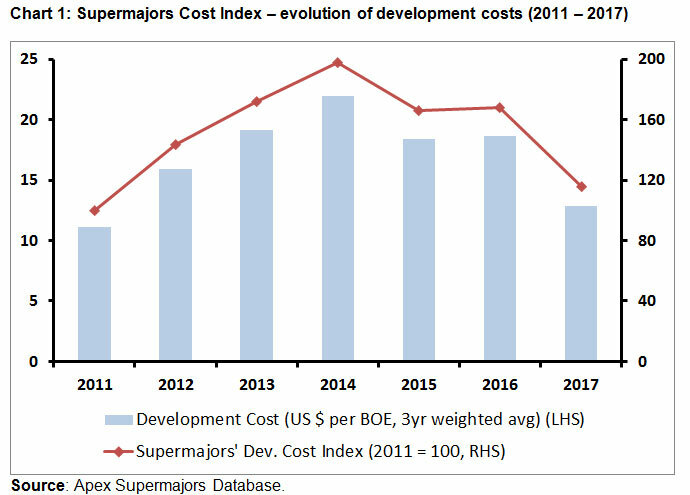 Apex Consulting: Supermajors Cost Index – Has cost efficiency peaked? Our proprietary Supermajors Cost Index, which almost doubled between 2011 and 2014, declined by more than 41% in 2017 compared with 2014. Despite this impressive reduction, cost was about 16% higher in 2017 than in 2011, when the industry was in the midst of significant cost escalation. Eni’s performance improved the most, followed by Chevron and Total. 2018 may turn out to be year when our Cost Index bottoms out. The industry needs a new business model. You can access the full version of the report here. 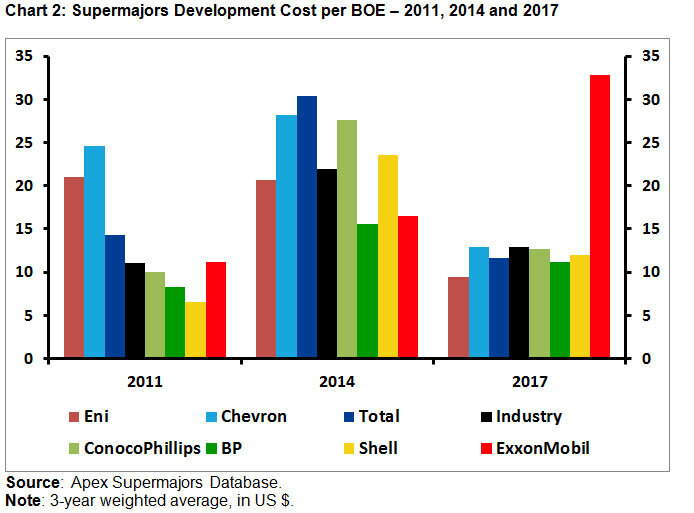 Given the recent pick up in upstream capital spending, we revisited our proprietary Supermajors Cost Index to determine how the industry performed between 2015 and 2017 in developing its reserves, and analysed this performance in a broader historical setting. We also investigated the latest performance of the industry’s ‘trendsetters’, the seven supermajors, in the same context. In the early 2000s, emboldened by the expectation of higher oil prices, oil and gas operators made resource and reserves development their primary focus. As a result, the industry spent vast capital sums on developing shale, deep water, ultra-deep water, and heavy oil resources. The greater technical risk profile of these resources meant that the costs of developing these assets were higher than the conventional onshore or shallow water developments. However, excessive focus on ‘volume growth’ in many cases resulted in poor planning and flawed project execution. Cost overruns and delays became the norm. A prolonged ramp-up in upstream capital investment placed unprecedented pressure on the supply chain and ushered in a period of significant industry-wide cost escalation. The combination of higher cost resources, industry-wide cost escalation, and cost overruns and delays was the main reason why our Supermajors Cost Index almost doubled between 2011 and 2014). (See Chart 1). The collapse in oil prices from mid-2014 caused wide-scale project cancellations and sharp cuts in upstream investment. This in turn eased pressure on the supply chain and caused service sector costs to decline considerably. At the same time, in a bid to reduce costs, the industry focused on developing projects with smaller footprints and lower capital intensity, using simplified processes and standardisation to achieve manufacturing-like efficiencies. Costs went down further as technological advancement reduced drilling times and boosted drilling productivity notably. Smaller project footprints, improved efficiency, lower input and service sector costs raised the cost efficiency of the sector significantly. As a result, our Supermajors Cost Index for 2017 has declined by more than 41% compared with the level seen in 2014, when the Index reached its peak. Among the seven companies analysed between 2011 and 2017, we found that Eni’s performance improved the most, followed by Chevron and Total. Although the 3-year weighted average development cost per BOE went down for these companies over this period, it increased for the other four companies in line with the wider industry trend. (See Chart 2). Looking ahead, 2018 may turn out to be the year when development cost deflation bottoms out, leading to a rise in the Index in subsequent years. Therefore, the industry needs a new business model, one that encourages greater collaboration and appropriate risk-sharing to prevent the recurrence of the runaway cost escalations of the past.